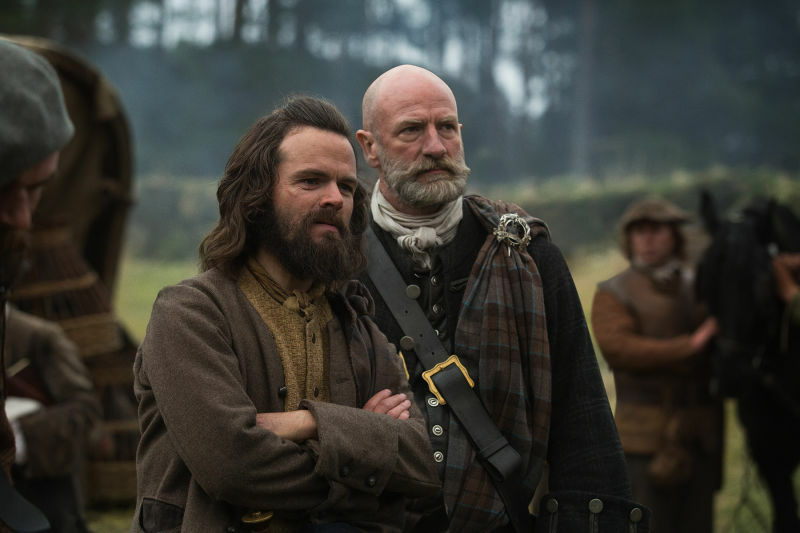 Mounting a period piece like Outlander means producing costumes. Lots and lots and lots of costumes. PILES of costumes. Costumes from not just the eighteenth century, but the 1940s, too. And don’t forget all the ensemble scenes like the clan gathering, which involve a whole shitload of extras, who cannot be naked. “One of the things that drives me crazy about shows is when the costumes look like they just came off the truck in a dry cleaning bag and then they go right back on before they get dirty,” he added. Hence the show’s aging and dying department, which does things like scorch redcoat uniforms so they’ll look properly knocked around. (They also wield cheese graters, and there’s a special hot room where they bake everything.) But they have plenty of coworkers: “There are people who do nothing but embroider and embroidered each one of those leaves and acorns out of metallic thread, and that took forever,” he said, pointing to Claire’s (stunning) wedding gown. I also got a chance to chat over the phone with Dresbach (who missed the festivities because she was in Scotland, designing still more costumes). She talked about Scotland as a design inspiration, all that knitwear and what we’ll see in season two (she promises balls-to-the-wall French costumes). You’ve been reading the books for years—how much of your work on the show is stuff you’ve had in your head for years, and now you get to make it real for other people? Pretty much all of it. I never read the books going, If I were going to design this as a television series, this is the outfit i would put her in. But when it came time to actually do it, it was all right there at the surface. I could just pull it up. I didn’t have to give it much thought. I knew these characters. So you start out with some ideas, but you want to make it as historically accurate as possible. What sources did you go to? You go to books, and, you know, and there’s almost always a book written about the history of the costume of a place, and there’s usually a number of books. If you want to study eighteenth century French costuming, there are libraries full of them. There’s very,very little about Scotland, because the culture of Scotland came under fire—exactly what our story is about—and an incredible amount of resources were wiped out. You have museums filled with actual French eighteenth century clothing or English eighteenth century clothing. But there’s very little on scotland. You’re forced to cobble it together from understanding that Scotland was a very sophisticated, advanced country in the middle of the eighteenth century, in the middle of the age of Enlightenment. So their clothing was going to be the same, pretty much, as everybody else’s. But then you come to Scotland and you live in Scotland. Then you understand really what it’s about. You have to tailor the clothing, or what I did is to tailor the clothing to the environment. You cannot be in Scotland and ignore the environment. So that probably was one of the two or three most defining elements of our designs, was the Scottish climate and country. Could you go a little more in depth on that? 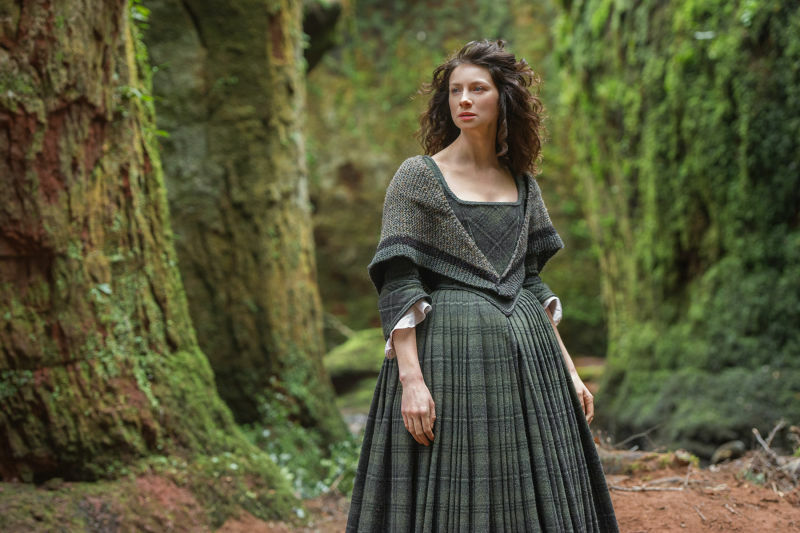 One of the things that really struck me was how gorgeous Claire’s costumes were against the Scottish background. You know, when I got here—and I’ve lived here now for two and a half years—I threw out every idea I had about eighteenth century costumes after about the first week of living here. Because first of all, the climate just wouldn’t allow for anything other than the sturdiest of clothing. But then, the landscape here—I don’t know, I don’t think enough is said about how beautiful Scotland is. And that’s all anybody ever talks about, is how beautiful Scotland is. But you don’t realize it until you live here—it is a staggeringly beautiful country, and even in modern culture you can see it reflected in what people wear. You can see that in any culture. So we took that then and translated it backward. If this is what modern Scots are wearing, what were their ancestors wearing? And you get your cues from the colors that you live in. The color of the sky, the color of the trees, the beautiful purples and browns and greys. It’s just extraordinary. There’s a dress that claire wears, it’s green and grey plaid, that was inspired by a branch that had fallen across the road. You just see it every day around you. You’re staring out the window, and it’s just amazing. We live out in the country in Scotland, we don’t live in any of the cities, and the movie that plays outside my windows everyday—I get up and theres deer prancing around in the yard and the sky is magnificent and it’s just incredible design inspiration. Living it! You know the Alexander McQueen exhibit that’s playing right now at the V&A? Who isn’t a huge fan of Alexander McQueen’s work? Well, it’s fascinating to view it now having lived in Scotland and to see how much of Scotland plays in the beauty of his clothing. It’s really an incredible inspiration. So you get there and you’ve had these ideas in your head, but you kinda start over when you arrive. What kind of timeline did you have to do all this work? Because it seems like a prodigious amount of work. That’s what I said! And a little bit more. Seven weeks before shooting, we didn’t have any sewing machines. Maybe it was eight weeks. So we produced, oh, about 120 some-odd costumes in that amount of time. We also discovered upon arriving that we weren’t going to be able to rent anything. Or very, very little. And that was terrifying. We knew we’d have to make all of our actors’ and then we had to make all of our extras’ [costumes]. Catriona [Balfe]—we had two weeks to make all of her clothes. There wasn’t a lot of breathing going on. It was pretty intense. We didn’t have to have every single thing everybody wore, but we had to have a solid amount of it completed it in about eight weeks. So for a long time we were just, “oh my God let’s just make sure no one goes out there naked!” You’re still designing, but a lot of it is designing out of sheer terror and panic. Then it starts to settle down and you get to really start doing some more interesting, detailed work. Although, you know, the stuff we did the first week stands up. I don’t remember making it but it looks really good. It’s amazing what you can do when you’re under the gun. It is. It’s a little frightening. And you know there’s also the little crazy dilemmas that you have to work out on your feet. But I think if you can say anything about anybody who works in this business, it’s you’ve got to be able to do that. You have to be an incredibly flexible person, and you have to be able to work under fire. Where are you sourcing your materials from? I guess Mad Men can scour vintage stores. Ron said the only thing you could rent were the redcoats, and he put his foot down about that. Yeah! The only thing in seven weeks that we could have rented, we had to weave the fabric. It was crazy. 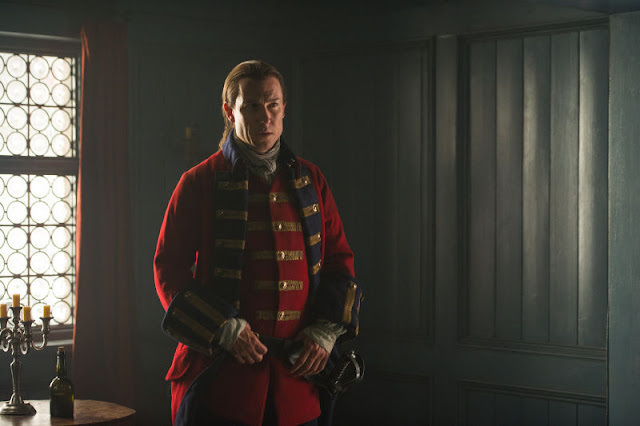 I had listened to him rant for years—every time any redcoat ever came across the screen, I had to listen to this giant diatribe about the wrong colors of red. And once I got this show up and going, I had to listen to him rant about how I had to make sure it was the right color red. So the only costume that we could rent, we had to make, and we had to weave fabric because we needed the right color. I was going to ask where you’d go to buy, say, the right woolens. But you had to create the plaids, the wool for the redcoats—what could you purchase? We did purchase everything else, and we tried to work really hard to try to source everything as locally as we possibly could. There are costumes you’ll see in the second half of the season, there’s a jacket that you’ll see that’s made out of scraps on the floor. Claire wears a collar which is woven-together pieces from another piece of wool. We got fabric from a lot of places. But we got it all with the idea that we were representing Scotland. That’s been our goal, to make sure that we did right by Scotland. So we used many local manufacturers, local mills wove our tartan for us, local people made our knit cowls—back to your earlier question, that’s one of the ways we kept authenticity. Because the people who lived here now are the generations that follow the people in our story. That’s how you find what’s real. And I guess that’s true to how people would have really worked in an environment like that—they wouldn’t have purchased a whole new bolt of cloth. They would have reused the fabric from another dress. Over and over and over and over. Eventually a baby four generations later is wrapped in the wool that was once somebody’s skirt. It’s really important. And other things happen. Like, we finished making Catriona’s costumes and at that point, I’m living in a 700-year-old house in Scotland, I know how cold it gets here. She’s standing there in an eighteenth century gown and you’re like, She looks cold! Why wouldn’t you cover up as much skin as humanly possible? Everybody here, we’re all wrapped up to our eyeballs. Why wouldn’t you have something? And we grabbed a knit scarf and wrapped it around her and it was like, Ah. It makes sense. So you look for those kind of pieces that tell a kind of truth. Your job as a storyteller is to make people believe what they’re seeing. I don’t need people paying attention and going, I think that’s a zipper! They’re not listening to the words out of the actor’s mouth. They’re now paying attention to whether or not my costume looks like it’s modern or it’s old or whatever. So the goal is to let them accept that what I’m telling them is true, and then go on and follow the story. Don’t pay attention to the clothes anymore. So it sounds you kinda started with whatever historical sources you had, put yourself in the environment and recreated the process to get the result—as opposed to reproducing something out of a book, say. That’s right. And I think to some degree, every costume designer does that. Part of the job is being a sociologist, an anthropologist, a psychologist. The auto mechanic who commits murder—you want to get into his world and into his head and into his psyche, so you can help tell the story of why he did what he did or who he is. You do the same thing here. But in a historical setting, where there isn’t a lot of other research to go on, you have to kind of find a more organic approach to how do you build a character. Then we went back and went Ok, is this a legitimate garment? Can we justify this?So we did a lot of research and there was indeed knitwear. Was it knit in the way that scarf was? Don’t have any research that says it was, don’t have research that says it wasn’t. So we concocted a story that Mrs. Fitz got tired of using regular knitting needles and had the local woodworker make her really big ones and then she made knit stuff for everybody. And I dare anybody to tell me she didn’t do it! How do you come to a project like this? Had you taken on a project that was this historical before? People always think that you just go out and rent everything. They just don’t know that you can’t run down and do that. There’s no eighteenth century department at Macys. At one point I went back to America and I said, I’m going to hit up all the studios and I’ll rent stuff there. And I went in and it just doesn’t exist anymore. There haven’t been a lot of period pieces made for a very long time, and now it’s experiencing a huge resurgence and it’s wonderful but all of us poor costume designers are struggling to make our own costume houses. I guess back in the day they had whole fleets of people to do it. And we have had to really create—we created a studio. and we went from empty rooms to about 30 seamstresses working for us, we have a team of people who age and dye all of our clothes, we have warehouses full of clothes and shoes and every possible accessory. We’ve created our own western costume in Scotland. Because you just can’t get in the car and even go to the fabric store. If you want to buy fabric you have to go to London. I shop in San Francisco for buttons. You need, to do a season, about 20,000 buttons. A man’s coat takes 35 buttons. It’s a mind-boggling, terror-inducing number of buttons. Has the process relaxed a little? Do you have more time now? No. On a normal show it would be, but Ron always says this about Outlander—it’s not like ER where you have that hospital and you go there every day. It’s not Seinfeld, and you’re in that apartment every day. On this show, we travel all over the place. In season two, we go to Paris, and there’s nothing in Scotland that’s Paris. They don’t wear the same clothes, they don’t live in the same buildings. Nothing. So you really do start from the ground up again. You can’t use the same costumes. We just finished making 900 costumes. Just for extras. But! the advantage is, knowing the books, I knew we were either going to die this season or I’d better start planning. So around christmas time, I started planning season two, and we started making clothes for season two in the spring, so we had more than seven weeks to build the French court, thank God. But it was still—today we were all sitting there with our heads in our hands, ripping our hair out, trying to figure out how the hell we were going to do what we needed to do between now and then. But that’s the nature of the business. I’ve never been on a show where you’re not trying to figure out how people are not naked. Is there anything you can tell us about Paris? I will tell you that, from the time I was about six years old, I’ve been in love with eighteenth century french costumes. It’s every fairy tale. It’s Cinderella. It’s a costume design dream. My whole career I’ve wanted to do exactly what we’re about to do. So we are very, very excited. And Paris is a fashion show. It’s the French court. It is about fashion. So it’s going to be spectacular. Every costume is designed to be unbelievably over-the-top and amazing. There’s very few stories that you get to do where the goal is to make everybody look fantastic. It’s really like—that costume is feeling a little ordinary. We need to make it MORE fantastic. It’s going to be good. Nobody will be disappointed, I promise.